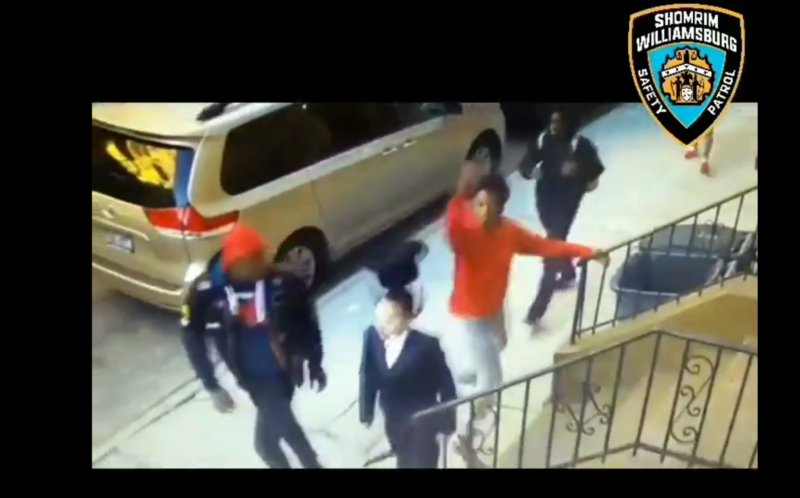 An image from surveillance video showing a group of teens knocking the hat off a chassidishe boy in Williamsburg last Shabbos. The NYPD has taken two teenagers into custody for several attacks last Shabbos on Orthodox Jews in Williamsburg, the NYPD and Shomrim said. The two boys, both aged 13, are suspected of being part of a group that threw a metal pipe into the window of Volkan shul on Franklin Ave. near Myrtle Ave. The group then fled toward toward Willoughby Ave., and while they were running, pushed a 10-year-old Jewish girl to the ground, causing minor injury. The same group of youths knocked the hat off the head of a 14-year-old chassidishe boy. The two teens were taken into custody by the NYPD’s hate-crimes unit. Their names have not been released, and charges are pending.